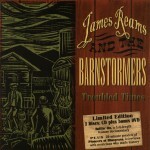 Rollin’ On ~ Take a ride on the Redbird Express with James Reams & The Barnstormers as the band criss-crosses the northeast playing at Lincoln Center, on radio programs, at bluegrass festivals and even for a square dance. This film provides a behind the scenes look at life on the road with the band. (Directed by Joe Coppa and James Reams). “Rollin’ On” was selected for screening at the 6th Annual NCBS and International Bluegrass Music Museum’s Bluegrass on Broadway Film Festival in Redwood City, CA (2013).